Building construction drawings used to be mostly hand-drawn with no effective way to be identically duplicated. They were always prone to get lost or damaged. Besides they were hard to carry and they took actual physical space which could be a head-scratcher in large projects where architects had to (or still have to) walk and search through endless stacks of hard drawing documents. With our expertise, you will let us systematically convert all your miscellaneous drawings to a unified CAD format. Our well-educated, experienced teams of architects, draftsmen, engineers, and technicians deliver scalable, editable, well-organized CAD files on the first go and within your budget. Computer Aided Design or in short CAD turned everything around. Only by shortly describing how CAD files store data and how they are designed to be worked on, we can shed a light on why there’s an attempt to convert other types of non-hard drawings like PDF, image or rasterized files to CAD format. 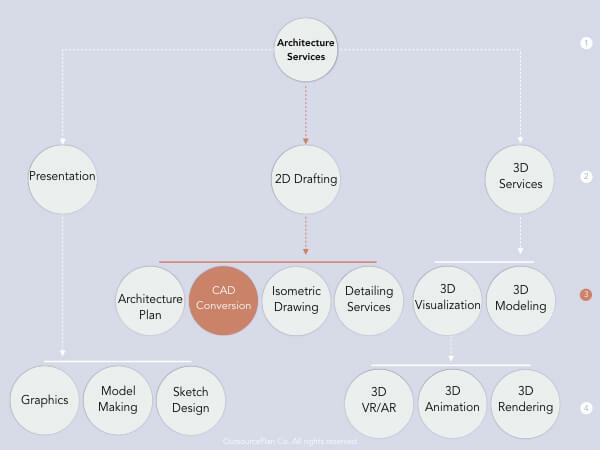 A long list of advantages could be counted for a CAD-based representation of different layers of a project but we will keep it short to the ones that make the most difference. This is where scores of CAD conversion services like 2D to 3D CAD conversion services, raster to vector conversion services, paper to CAD conversion services show up. CAD files store all elements of a drawing based on a robust vector-based geometry. Easily put, vectors, as opposed to rasters, are drawn based on a mathematical function. So they won’t lose resolution as you zoom in; where for rasterized drawings like an image, visual quality as you zoom in depreciates. So everything’s well-defined and properly put in place in a CAD file. They are not hard to move and edit. Plus with the courtesy of cloud-based shared storages, virtually countless engineers can collaboratively work and develop a CAD file together. So, as a result, there’s a minuscule chance of a CAD file getting lost for good or getting damaged irreversibly as is the case with hard copies of construction drawings. With CAD Conversion Services, you won’t have to spend money on hiring draftsmen to duplicate your project’s drawings, because CAD files can easily be copied. CAD drawings can be categorized into different layers that can be toggled on and off. Something almost impossible with rasterized drawings. As a result, your drawings smoothly flow among the parties involved, who easily modify its content and classify various parts of it in different layers. Here at OutsourcePlan, we have been the number one choice of different architecture and civil engineering firms around the world for outsourcing their CAD conversion services to. With our expertise, you will let us systematically convert all your miscellaneous drawings to a unified CAD format. Our well-educated, experienced teams of architects, draftsmen, engineers, and technicians deliver scalable, editable, well-organized CAD files on the first go and within your budget. Through our 2D to 3D CAD conversion services, raster to vector conversion services, and paper to CAD conversion, we use the last technological tools to properly convert your existing pile of unorganized, cumbersome drawings to CAD files in the smoothest most accurate and secure way possible; methods like VBA programming and utilizing developed codes in C++ to speed up the conversion process with double-checked accuracy; producing files ready for you to take up the rest of the work and seamlessly bridge your past to the future. Further along, we say how we do CAD conversion services for our clients, what makes us more appealing among our competitors, and what tools we use to produce your CAD files. Revit can take care of your modeling, rendering, and BIM-oriented reports of any design. It is a powerful tool to adjust a project as it progresses and changes along the way. Modeling a building in revit is more than merely modeling it’s volumes; rather it models the whole construction process. It also possesses a comprehensive repertoire to place frameworks and fixtures as they are industrially made. So they can help with comprehensive CAD Conversion Services. Is a BIM-oriented software that greatly helps with modeling a building down to all hidden structural layers. all of which can be used for a deeper, more complete CAD Conversion Services. Is a modeling tool responding to a wide range of different industrial demand. It is built on NURBS geometry, which allows modest computational load on creating curved objects. It has a vibrant supporting community and a great number of plug-ins for implementing complicated forms that are can not be done otherwise or at least with insurmountable effort. Rhino can also produce 2D CAD files of a project, so depending on your demand, we can offer out CAD Conversion Services in Rhino too. 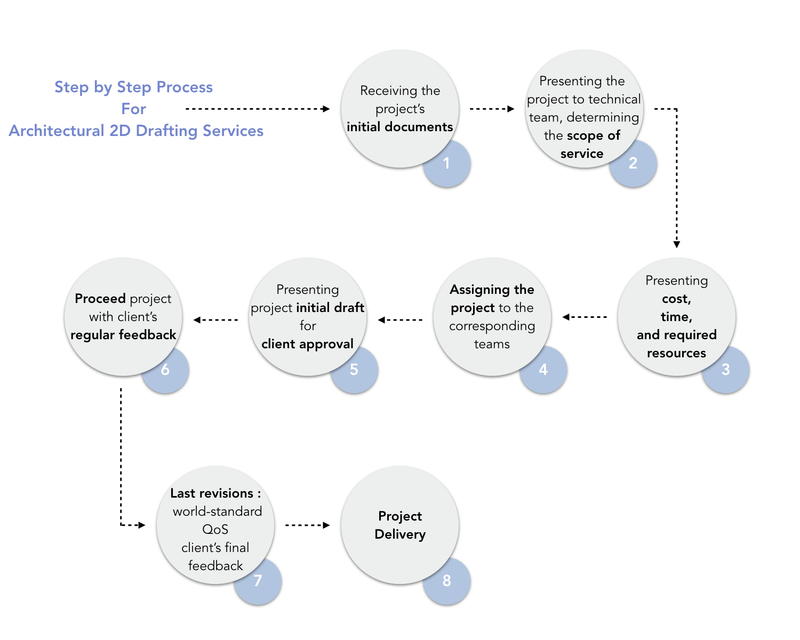 Provides an easy way to model your 2D and 3D documents, similar to how hand-drawn sketches are done. It is yet another tool to take care of your CAD Conversion Services by providing CAD files out of PDF, image, or hand-drawn files.